Located at pool level, this room features aa SMALL window that EITHER overlooks the pool OR THE NEARBY CHURCH, reminding you that you are truly on holiday in Santorini! Whilst it is the same size as our other pool facing double, the layout of this room gives it a much cosier feel. As well as the double room, this accommodation also comes with a private bathroom complete with shower, refrigerator and other modern amenities. With its pool level location, it provides maximum convenience for accessing the pool as and when you feel like it. And with its beautiful unobstructed views of this stunning Island, we think you will feel like it a lot! 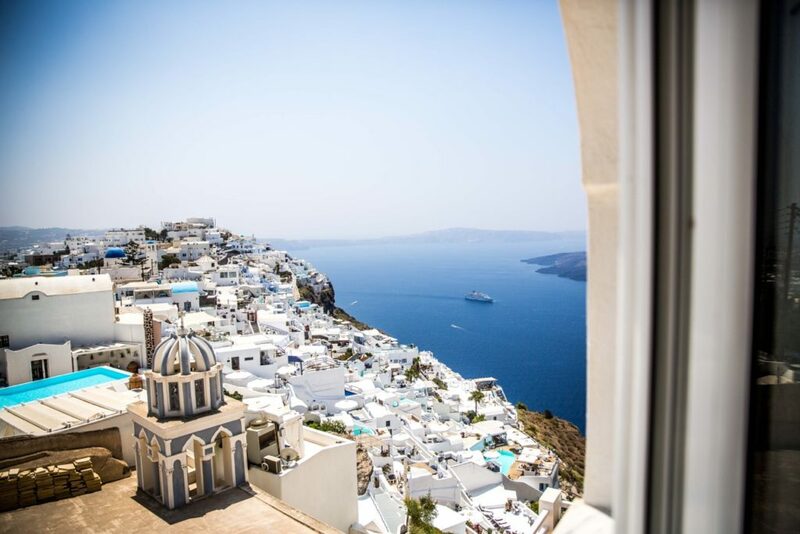 We never tire of this view and we don’t think you will either; Caldera gulf, volcano, Firostefani village, Akrotiri and Thirasia Island can all be seen from the location of our hotel.